Note: palm oil mill effluent, palm oil slurry and palm oil sludge may or may not be synonyms, depending on the context. In particular, palm oil sludge sometimes refers to the decanted effluent (decanter cake). However, this is not always the case and this datasheet will use the generic term palm oil mill effluent. Palm oil mill effluent is the voluminous liquid waste that comes from the sterilisation and clarification processes in milling oil palm. The raw effluent contains 90-95% water and includes residual oil, soil particles and suspended solids. 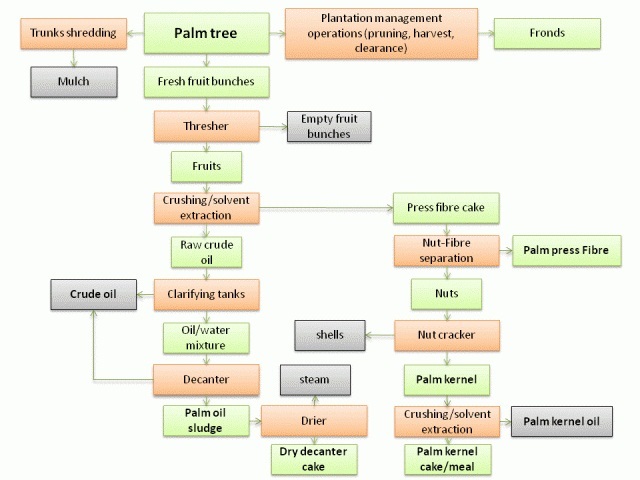 An industrial oil palm mill produces about 2.5 t of effluent per tonne of palm oil, or 0.5 tonne of effluent per tonne of fresh fruit (Ho et al., 1984; Pérez, 1997). Palm oil mill effluent is a highly polluting material and much research has been dedicated to means of alleviating its threat to the environment. Since the 1980-1990s (depending on the country), developments have taken place in the crude palm oil industry to make it environmentally more sustainable, and wastewater treatment systems are now commonplace in the main areas of production (Chavalparit, 2006). There have been numerous attempts to convert palm oil mill effluent into a viable animal feed resource. While artificial drying methods have been discontinued, due to excessive fuel cost and the large capital investment required, the conversion of fresh palm oil mill effluent into a potential feedstuff now involves fermentation (anaerobic, thermophilic and acidophilic), followed by concentration (centrifugation or decantation down to 15 to 20% DM) (Pérez, 1997; Chavalparit, 2006). Further drying can be done by absorption on dry feeds such as cassava roots, dehydrated grass or palm kernel meal (Pérez, 1997), or by conventional drying methods (Chavalparit, 2006). Palm oil mill effluent is a fresh product available in the vicinity of oil palm mills. Palm oil mill effluent is a highly polluting material, due to its high biological oxygen demand (BOD), low pH and colloidal nature. It was estimated that a processing plant with a capacity of 10 tons fresh fruit per hour would need a water treatment plant comparable to that required by a population of half a million inhabitants (Brezing, 1986). While considerable progress has been made since the time when oil palm wastewater was simply discarded in nearby waterways, liquid oil palm wastes still affect the environment and the quality of life in rural areas. Palm oil mills now employ conventional biological treatment systems, such as anaerobic and facultative ponds in series, anaerobic and aerobic lagoons in series, or anaerobic digestion tanks and facultative ponds in series. However, some mills are still not able to treat their wastewater in ways that meet effluent standards. In the rainy season, overflow from the wastewater treatment plants causes heavy water pollution to nearby waterways. Another issue is that anaerobic ponds release greenhouse gases (methane and carbon dioxide) that contribute to global warming. Communities located near oil mills may also suffer from odour emissions caused by poorly managed effluent treatment systems (Chavalparit, 2006). Increasing the consumption of palm oil effluent by livestock, if possible near the production site to avoid wastage, palatability issues and transportation, has been proposed as a means to minimize pollution (Devendra, 1985). However, using palm oil effluent for livestock feeding could only be a partial solution to effluent management, as it was estimated that a 40 t/h oil mill would require around 44,000 pigs or 43,000 cattle for the entire effluent to be utilized (Agamuthu, 1995). Fresh palm oil mill effluent contains mostly water (90-95%). Decanted effluent contain 60-80% DM and dried effluent contains more than 90% DM. The contents of the dry matter are characterised by considerable variability with, particularly, the amount of residual oil varying from 5% to more than 70% DM. Effluents from palm oil mills using wet process are lower in fat than effluents from mills using dry process (Seephueak et al., 2011). Ash ranges from 9 to more than 30% DM and protein is generally low (10-15% DM). The variability in cell wall content is very large: NDF ranges from 15% to more than 60% DM, due to variation in the presence of fibrous solids. As a result, the nutritive value of palm oil mill effluents should be assessed on individual samples. Palm oil mill effluent tends to concentrate major minerals and trace elements. For instance, in Nigeria, the decanted sludge analysed by Bamikole et al., 2009 contained about 80 mg/kg DM of Cu, and such a high level of copper could be toxic to sheep. Therefore, the use of this product in ruminant feed should be assessed carefully for potential mineral toxicity (Seephueak et al., 2011). An assessment of feeding value using sheep indicated that up to 40% palm oil meal effluent can be used either alone in molasses urea-based diets, or combined in equal proportions with palm press fibre, but this latter blend should not be stored for more than 36 hours as it rapidly becomes unpalatable. Field trials with buffaloes and cattle in oil palm estates have also shown beneficial results from supplements of palm oil effluent. Raw or concentrated palm oil effluent can be absorbed on cassava meal, dehydrated grass or palm kernel cake and dried into feed cakes (Göhl, 1982; Devendra et al., 1983). A diet based on oil palm by-products (palm kernel cake 30%, palm press fibre 15%, palm oil mill effluent 18%, molasses 35% plus urea and minerals) met the nutritional requirements of dairy cattle (Shibata et al., 1988a; Shibata et al., 1988b). In feedlot cattle fed a 40:60 mixture of dried palm effluent and palm kernel expeller meal, growth was lower (650-690 vs. 750-760 g/d) than in animals fed only palm kernel meal, but performance was still considered satisfactory because of the high price differential between palm effluent and palm kernel meal (Yusoff et al., 1989). In Thai native cattle fed Plicatulum hay as a roughage source, decanted palm oil effluent included at 40% in the concentrate affected intake, digestibility, rumen fermentation and blood metabolites and it was concluded that the optimum level should not exceed 30% (Seephueak et al., 2011). In goats fed a basal diet of rice straw, 3:1 and 1:1 ratios of palm effluent:palm kernel meal were equally good supplements in terms of live-weight gain (Phang et al., 1992). Fresh or dried palm oil mill effluent or products derived from it can replace part of the maize in pig diets, but at relatively low amounts (10-15% of the diet DM). In South-East Asia, fresh centrifuged sludge solids included at 14% (diet DM) in diets for growing pigs gave lower performance than the control maize diet (650 vs. 700 g/d average daily gain and 3.83 vs. 3.36 feed conversion ratio) (Ong, 1982). Included at up to 20% of the diet, dried palm oil mill effluent for growing/finishing pigs was feasible but performance was poorer and carcass fat deposition increased with higher rates (Ong, 1982). In Ghana, fresh (80% DM) palm oil mill effluent was included at up to 30% (as fed basis), to replace up to 45% of maize grain in ad libitum diets for growing pigs without affecting growth and generally improving carcass measurements (Abu et al., 1984). In a similar experiment in Nigeria with weaner pigs fed up to 25% liquid palm oil mill effluent, there were positive relationships between daily gain, feed intake, backfat thickness and the inclusion rate of the effluent, but feed efficiency and diet digestibility decreased (Fanimo et al., 1998). In both experiments, the inclusion rates are expressed on fresh basis, so the amount of effluent dry matter is actually much lower (less than 10% diet DM). 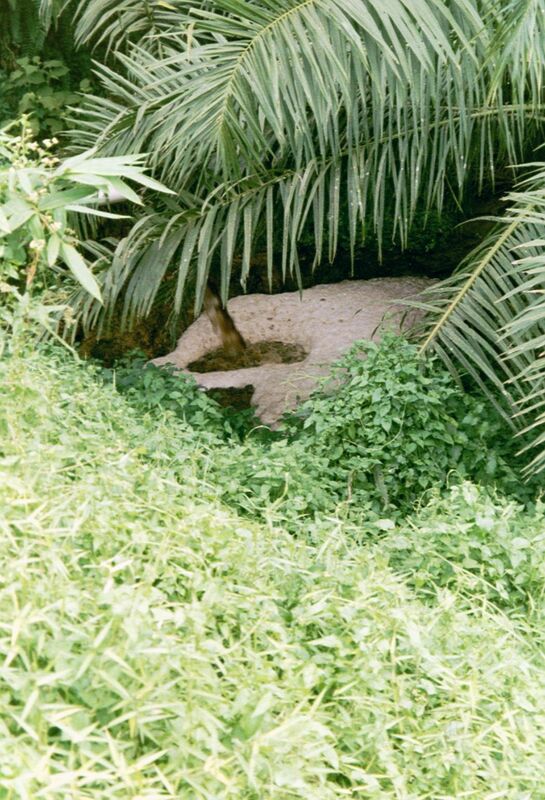 Fresh oil palm mill effluent is fat-rich but its high moisture content makes it difficult to incorporate in standard poultry diets (Atuahene et al., 1987). Other limiting factors are the low protein and amino acid contents, and the high fibre content (Sinurat et al., 2000). As a consequence, relatively low amounts (5-15%) should be fed, depending on the process (fresh, dried, fermented), composition and poultry species. In Ghana, a fresh (82% moisture) effluent with a particularly rich oil content (more than 70% DM) included at 5 or 10% (as fed) in broiler diets increased feed intake and growth performance (Atuahene et al., 1987). The same effluent, but sun-dried (11% moisture), mixed with rice bran was introduced at 10% in broiler diets without significantly affecting feed intake, weight gain and feed conversion efficiency (Atuahene et al., 2000). In Indonesia, the best inclusion rate of dried palm oil mill effluent was 5% since 10-15% depressed feed intake (though without significantly affecting growth and feed conversion). Fermented palm oil effluent was included at up to 10% of the diet, as higher rates depressed growth (Sinurat et al., 2000). There was no advantage in feeding fresh rather than dried fermented effluent in both broilers and native chickens (Sinurat et al., 2001b; Sinurat et al., 2001c). Replacing 20% of the maize energy in the diet (8% as fed) by a decanted (25% moisture) palm oil effluent was found to be economically beneficial (Bobadoye et al., 2006). A 7.5% inclusion rate also gave better growth and feed efficiency and was also economically viable (Kagya-Agyemang et al., 2008). However, this product impaired meat quality, as it decreased the proportion of lean meat and increased the lipid and cholesterol content, as well as its oxidative susceptibility vis-à-vis the accumulation of dangerous lipid peroxidation products (Onibi et al., 2011; Kagya-Agyemang et al., 2008). Growing ducklings were found to be slightly more tolerant than broilers to dried effluent, and up to 15% (fermented or not) can be included in their diet (Sinurat et al., 2001a). Dried palm oil effluent can be fed to growing rabbits in replacement of maize offals at 10% of the diet without deleterious effect on growth performance (Abu et al., 1993). The use of palm oil mill effluent was studied in four Indian carp species, namely silver carp (Hypophthalmichthys molitrix), catla (Catla catla), rohu (Labeo rohita) and mrigal (Cirrhinus cirrhosus). The fish were harvested after 9 months and the maximum individual growths of silver carp, rohu and mrigal were 700, 550 and 600 g respectively whereas the average growth of catla was 35.3 g (Babu et al., 2001). 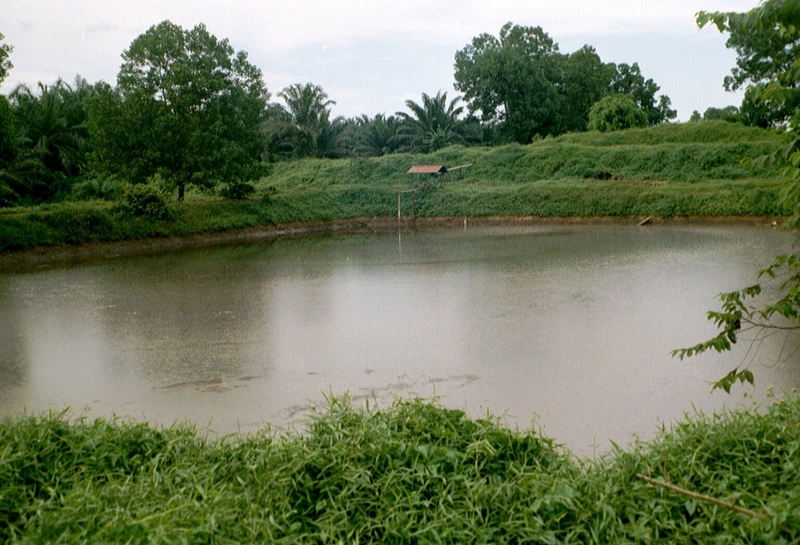 Palm oil mill effluent has been tested as a potential medium for growing animal species used to feed fish and other aquaculture species. Dried palm oil mill effluent was evaluated in a closed recirculation system for its suitability to replace live algae (Selenastrum capricornutum) in the culture of Sudanese fairy shrimps, a live food in aquaculture. Growth (increase in length), cyst production and mortality were generally similar to those obtained with more costly algae, though it was unclear whether this success could be attributed to the nutritional quality of the product or to the colonisation of adventitious micro-organisms, who may either increase the digestibility of the feeds or act as a supplement (Jawahar Ali et al., 1995). The rotifer species Isochrysis sp., grown in a modified medium of aerobically digested palm oil mill effluent was suitable to be reused as a supplement to further enrich and improve other rotifer cultures, such as Nanochloropsis sp. (Vairappan et al., 2008). Chironomid larvae (bloodworms) are a valuable live food for fish or cultured invertebrates. The production of chironomid larvae was significantly higher in palm oil mill effluent than in algal (Chlorella vulgaris) cultures (Habib et al., 1997).